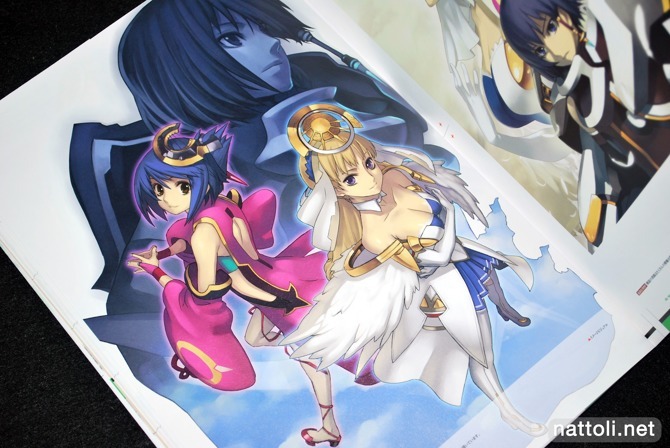 Ar Tonelico Visual Book Souten Rakudo focuses entirely on the game characters and promotional art works from the Ar Tonelico series games I - III. For those of you who've never purchased any Ar Tonelico art collections, then Ar Tonelico Visual Book Souten Rakudo is the one to buy. On the other hand, if you've purchased any of the previous Ar Tonelico guides, well, then you're in for a lot of repetition. 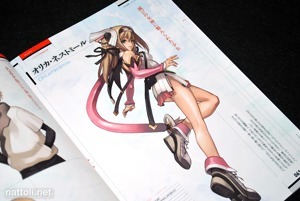 Ar Tonelico Visual Book Souten Rakudo is an A4-sized art book and 192-pages long yet manages to stay relatively thin due to the paper quality. I would describe the paper as slightly better than a magazine, as the pages don't feel at all sturdy. But on the bright side, it doesn't take away from the print quality, which is still high with barely visible dots per inch. The cover art work, and the art work below the slip cover are both newly drawn and repeated inside the art book itself. 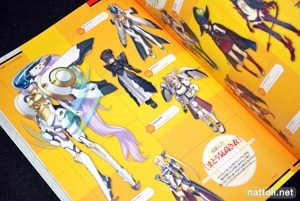 The art book goes through the games in order, starting with Ar Tonelico: Melody of Elemia. 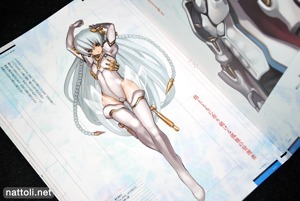 The promotional art work for the game, which includes CD covers, takes up pages 8 through 23, with most of the works receiving a full page. 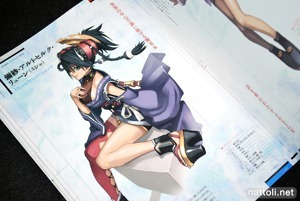 The materials book for Ar Tonelico III only just came out at the end of April this year, so if you have that one, all the illustrations in that section of Souten Rakudo must look very familiar. 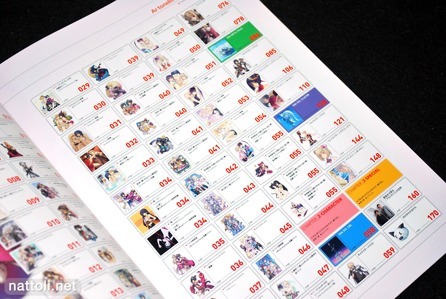 Ar Tonelico III is covered from pages 42 through 55. 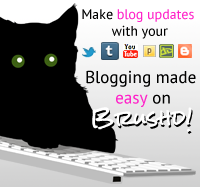 That's pretty much it for the promotional art work side of things. From this point on, it's all character profile illustrations, finishing each section with a few pages of "Event Scene Galleries" for each of the games. The illustrations are also sorted by game, with again mostly illustrations that were previously in the other Ar Tonelico materials books. I don't buy a lot of video games books, but when I do it tends to be because the artist involved is one that I like. I think the Ar Tonelico games are the reason I first became a fan of Nagi Ryou, with his very unique style in character illustration. 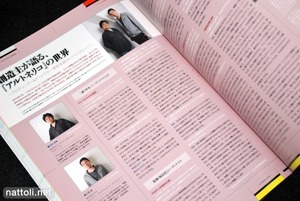 His flare in game design definitely carries over to his original works and fan arts that you can find in his doujinshi. 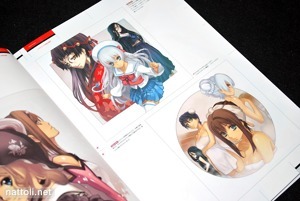 Ar Tonelico Visual Book Souten Rakudo finishes up with a 10-page interview with Atsunori Kawachi and Akira Tsuchiya followed by around 24-pages of random and rare costumes worn throughout the games by the characters. There are even a couple of pages of wedding dresses ^^; Overall, it's a great visual book, focusing entirely on the illustrations on the games. If you've never purchased any other Ar Tonelico visual book, this is definitely the one to get. I hate artbooks with too much text. Some of those text filled pages just look really messy. Thanks for the heads up. I happen to be currently playing Ar Tonelico II, and I was planning to buy the artbooks, so this review comes just at the right time. Though know what you mean, when I got the 'Tony's Art Works from Shining World' book, I sold off the previous two materials collection books as the newest book had all the illustrations from the previous two as well.